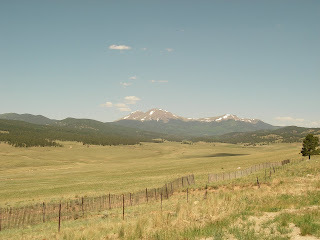 Friday morning we started from the campground outside of Buena Vista on Hwy 285 with 2 climbs and 50 miles for the day. We had a nice ride through the valley up to Trout Creek Pass. Then we descended into South Park and headed toward Fairplay. The traffic increased and a horrible rumble strip appeared. Then the headwind started. We struggled and had completed around 25 miles and then stopped. Conditions were really getting scary. We were in deep discussion about contacting Ray and Brenda, when we heard a car pull up behind us. We turned around and there were Ray and Brenda! We had a brief discussion about wind, traffic and the road and agreed that a ride to Denver was the best decision. There was a challenge putting the bikes and the trailer and all of us in the car, but we succeeded. The ride to Denver was an excellent idea as we watched the shoulder disappear and the traffic increase. We spent the night at Bear Creek Park and headed to Belinda's mom's house Saturday morning. 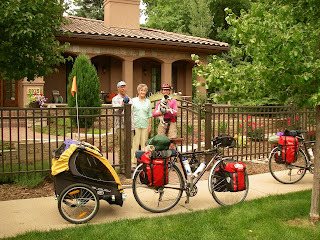 We're visiting relatives in Denver and Longmont through July 5. We start back on the road Sunday the 6th from Ordway, Colorado on Hwy 96. Hey you guys! Been following your trip, nice to live vicariously through you on this one! You're pretty corageous making this trip - up hill, down hill, heat, wind, rain - very inspirational! Enjoy the next couple of days, you deserve it - happy 4th of July - I'll be at the cabin, yay! I'm a little slow to get into this blogging thing but have been following your trip and really enjoying it. It's so nice to be in touch with you even when you are out in the middle of who knows where. Diana has helped me to decipher this so we'll see if I am blog literate. Ray and Brenda to the rescue! Tell Belinda's mom "hola" from us. Happy 4th of July to all of you! We'll be at the cabin with Patty! Hey Patty, glad to see your comment here! We're in Longmont today but will be back in Denver for the 4th. We hope you have fun at the cabin! Hi Diana, We have been keeping up with the California fires via e-mail from our friend Greg. It sounds awful. It was very nice to have Ray and Brenda show up just when we needed them. What luck! B.B. King, Wow. We have seen him three times and it is always special. So glad you got to enjoy his show. Hi Riesa, glad to hear from you! I think you can now consider yourself blog literate. We hope to hear more from you. Leslie, have fun at the cabin with Patty! Hugs all around. Hey John, we can't blame Adventure Cycling on this goof. We were way off route going north to Denver. We selected the roads (it may have about the only way to go) but had no input but a state road map. Ray does have bike attachments but it still was a packing challenge. I wonder, did you and Bill manage to hook up? Joel, have a great trip! When you get back we'll show you our collection of pictures of silos (as you know, these are what pass as topography through out the plains). Bon voyage and we'll wave back!